Agriculture Secretary Ann M. Veneman has announced a unified food safety research agenda to improve the efficiency and effectiveness of food safety programs -- one of several key initiatives USDA is undertaking to enhance food safety and improve food inspection systems. USDA also released a list of additional research needs specific to meat, poultry and egg products that the Food Safety and Inspection Service (FSIS) will encourage non-governmental entities to address, with government research complementing those efforts. *develop rapid and sensitive detection methods for abnormal prions to prevent the possible spread of transmissible spongiform encephalopathies. 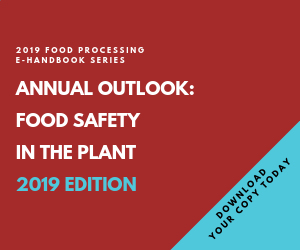 FSIS released a food safety vision document in July that outlines key steps to improve food safety and protect public health. In addition to the research agenda, the vision paper identifies strategies to improve workforce training, streamline technology implementation, identify best management practices and risk analysis coordination. The complete USDA unified food safety research agenda is available at http://www.reeusda.gov/ree/doc/foodsaf_research.doc. The research priorities specific to meat, poultry and egg products and the vision document, in addition to other food safety information, is available at http://www.fsis.usda.gov/.